Fraud can take many forms in a medical practice. 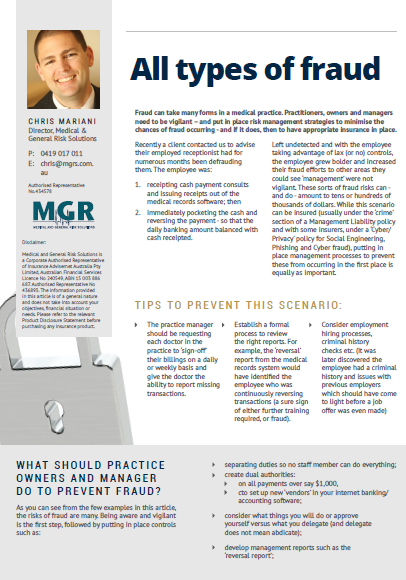 Practitioners, owners and managers need to be vigilant – and put in place risk management strategies to minimise the chances of fraud occurring – and if it does, then to have appropriate insurance in place. Left undetected and with the employee taking advantage of lax (or no) controls, the employee grew bolder and increased their fraud efforts to other areas they could see ‘management’ were not vigilant. These sorts of fraud risks can – and do – amount to tens or hundreds of thousands of dollars.